This is the fifth post in my Family History Binder series. Click here to go back to part 1. 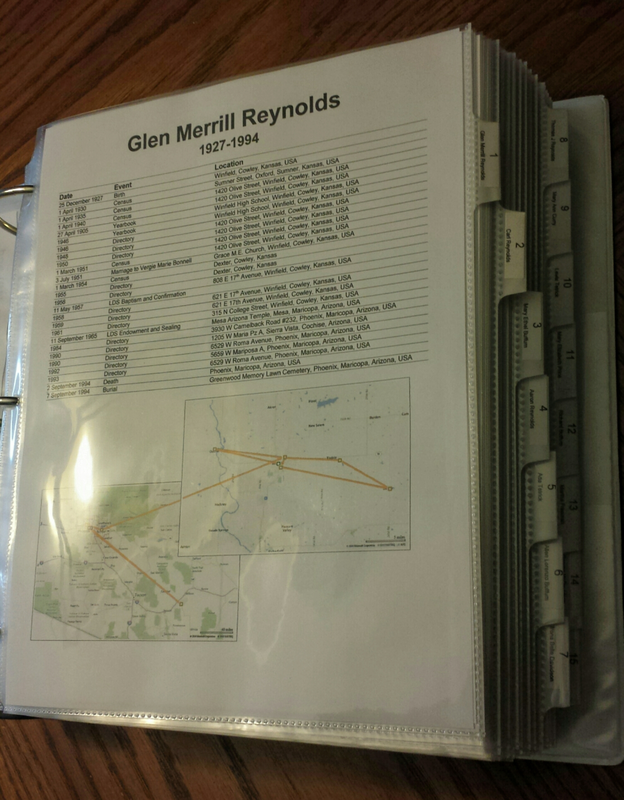 The first page of each ancestor section contains a timeline of the person’s life along with a map showing the locations they lived. I put this sheet inside the Avery Clear Pocket Label Dividers for each individual. I use Family Tree Maker (FTM) to keep track of my research. As I input each fact into FTM, they are automatically put in chronological order. I then opened a spreadsheet and with the two programs side-by-side I was able to quickly type the information to create a timeline. I also used Family Tree Maker to create the map. After clicking on the “places” tab (#1 in image below), I then changed the dropdown “list by” menu on the left to “person” (#2) and then selected the individual from the list (#3). On the right side, I then checked the boxes (#4) next to the facts that I wanted to include in my map. This will only work if your locations are in the correct format. Then I zoomed (#5) so that the route was centered on the screen. You can then use the snipping tool on your computer to copy the map on the screen, but I found that clicking the “print” button (#6) and then printing as a pdf resulted in a cleaner look. One of my individuals moved a few times in Kansas and then moved to Arizona and lived in a few different locations there. To show more detail, I decided to split it into two separate maps and used both. Once I had my maps, all I did was copy and paste them to the bottom of my timeline spreadsheet. Click here to go on to the next section about how I arranged the documents and sources for each individual. How do I know if this really is my ancestor?